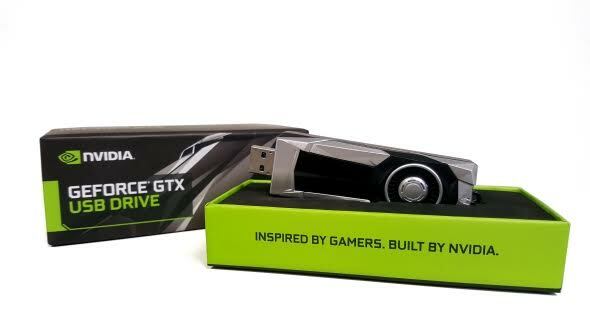 Win one of Nvidia’s super-limited edition 64GB GeForce GTX USB sticks! Ah, April Fool’s day. One of the worst times of the year to be alive. From Ms. Pac-Man appearing in Google Maps to a Geralt-in-the-bath-tub figurine, every techie, gamey company likes to get in on the ‘hilarious’ action. Nvidia were no different, announcing the GTX G-Assist USB stick, which promised to keep on gaming for you when you went AFK. For other things you can plug into your PC, check out our list of the best SSDs for gaming. But just before this year’s E3 game-gasm, Nvidia announced it wasn’t just an April Fool’s joke, they genuinely were creating the GeForce GTX USB stick. Only in the real world it wasn’t some sort of cheat drive, but a super-speedy USB 3.0 stick with a beefy 64GB capacity and the same GeForce design cues as their GTX 1080 Ti cards. The bad news is they’ve only made 1,080 of them (see what they did there? ), and the even worse news is the GeForce Experience competition Nvidia ran to win a stick finished weeks ago. But fret not, we’ve managed to snaffle one of the gorgeous li’l gadgets to giveaway to one lucky reader. If you want to be in with a chance to win one of the gamiest USB drives on the planet then all you have to do is use the widget below to enter. Every action you complete is worth one entry into the giveaway, and the more actions you complete the more chance you’ll have of winning. We’ll also need your email address so we can send you a code upon winning – we won’t send you spam, we promise! Please note that we will email the winner to acquire a physical address to send the USB stick to.